Cranberry Cashew Caramel Patties are sometimes called "Bog Frogs," but don't let the funny name fool you! 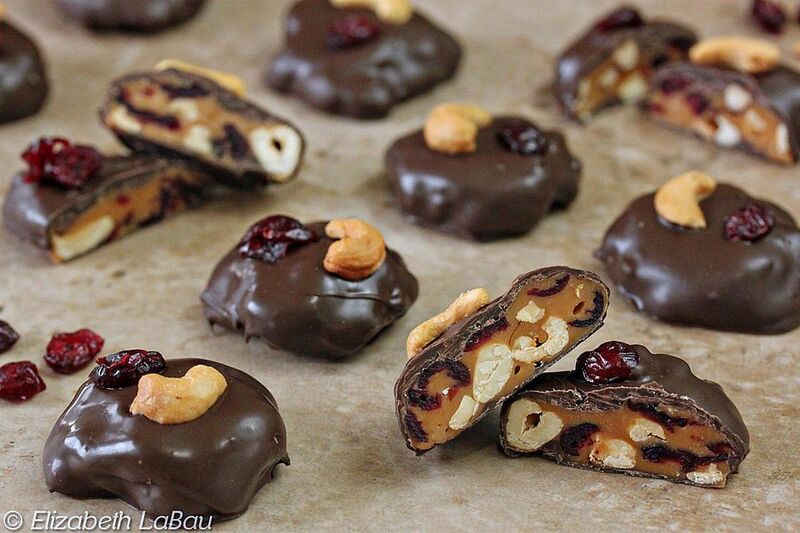 They're a riff off of the popular Turtle Candy recipe, but instead of containing caramel and pecans, they're loaded with cranberries and cashews, held together with chewy caramel and dipped in chocolate. These are a great alternative to traditional caramels, and they make a wonderful holiday gift! Place the caramels and cream in a microwave-safe bowl. Microwave in 30 second increments, stirring after every 30 seconds, until the caramel is melted and smooth. Add the dried cranberries and cashews, and stir until everything is well-mixed. Line a baking sheet with aluminum foil or waxed paper, and spray it with nonstick cooking spray. Use a cookie scoop to form balls of caramel and place them on the baking sheet—you should get about 18 large balls from this recipe. Wet your hands very lightly with water, and press the balls into a patty shape. Refrigerate until the patties are very firm, at least 30 minutes. Melt the candy coating in the microwave in 30-second increments, stirring after every 30 seconds to prevent overheating. Use a fork or dipping tools to dip the patties in the melted coating. Let the excess drip back into the bowl, and scrape the bottom of the patties against the lip of the bowl to remove any extra coating. Place the dipped patties back on the baking sheet, and while the coating is still wet, press a dried cranberry and a cashew on top of each one. Once all of the patties are dipped, refrigerate the tray to set the coating, for at least 30 minutes. These candies can be stored in an airtight container in the refrigerator for several weeks. For the best taste and texture, let them come to room temperature before serving. Click Here to View All Caramel Candy Recipes!